Pairing Pot with Food: The Next Big Culinary Trend? Not sure which strain of pot pairs best with wagu tartare? Headband is a great choice. For dessert, Platinum Girl Scout Cookies is the perfect complement to a dark chocolate ganache torte. Cultivating Spirits started offering food, wine, and cannabis–pairing dinners last summer. Wolf believes the upscale events, sparked by the legalization of recreational marijuana in Colorado, Oregon, Washington, and Alaska, are part of a growing demand for curated cannabis experiences. Wolf insists that these events are about more than lighting a joint and getting high. In fact, he talks about terpenes (the aromatic compounds found in marijuana) and the flavor profiles of small batch cannabis with the same passion that some sommeliers use to describe tannins in wine — and he takes the same care in selecting strains to complement the dishes served during the Sensational Fusion Experience, a five-course cannabis-pairing dinner. For example, Wolf recommends pairing sativa, a species that offers a more uplifting buzz, for lighter fare like fish and vegetables while indica, which has a more calming effect, is a better choice with heavier dishes like steak and comfort foods. Before each dinner — which includes gourmet fare prepared using local, organic ingredients, wine served with each course and, of course, cannabis — participants learn how to smoke marijuana to best experience its flavors. (Hint: There is more to it than sparking a joint and inhaling). Wolf explains how to ID sativa or indica species based on the color and texture of the marijuana, and he encourages diners to breathe in the aroma to experience the full scent profile. After that, it’s time to pack a small amount into a bowl, burn a fresh hit and notice how the flavor changes between inhaling and exhaling. Hapa Sushi also believes that cannabis is a great complement to cuisine. The Denver restaurant created a “pot pairing” menu to celebrate the legalization of recreational marijuana. Although the menu was developed as part of a creative ad campaign and the restaurant doesn’t sell cannabis with its crab rolls (much to the disappointment of diners) a lot of thought went into creating the pairings, which include suggestions for pairing the Pakalolo Shrimp entree with Pakistani Kush and smoking Sour OG to complement the honey miso salmon. The art of food and cannabis pairings is proving to be big business. Cultivating Spirits charges $249 per person for the Sensational Fusion Experience; in the last six months, Wolf has hosted at least two events per month — and demand continues growing. An LA-based chef who uses the moniker “JeffThe420Chef” is also capitalizing on the demand for elevated marijuana experiences. The cooking classes he offers through Feastly — The Art of Cooking with Marijuana and Pot Brownies & Magical Cookies — are selling out. But he’s not teaching students how to toss a handful of herb into a batch of brownies. Jeff compares the interest in cannabis cooking classes and pairing experiences to the craft cocktail trend that had tipplers signing up for mixology classes and experimenting with new cocktail recipes. 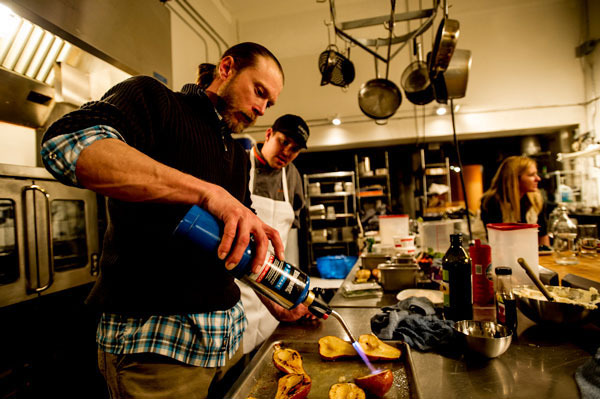 In addition to offering classes through Feastly, Jeff also owns Cannabis Catering and coordinates dinner parties that incorporate marijuana into every course. While cannabis is the highlight of cooking classes and pairing events, the hosts don’t provide marijuana. To honor Colorado laws, Cultivating Spirits put a creative spin on the BYOC requirement; the evening event starts with a stop at a local dispensary where diners can purchase the cannabis recommended for the evening meal. In California, where the JeffThe420Chef hosts classes, participants are required to bring their own marijuana and present a valid California Medical Marijuana ID card (the 420 Chef has his own card).